Click here to view the Google Map to Playa Laiya. Go to http://beachproperties-ph.com to see complete project details. 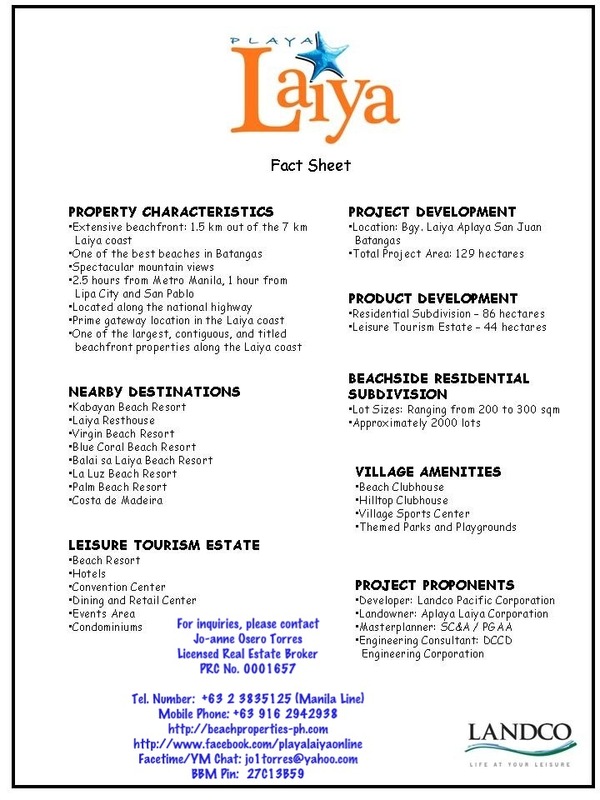 We are pleased to introduce to you LANDCO’s newest seaside residential resort community development: PLAYA LAIYA. Situated on the south-easternmost tip of Batangas, Playa Laiya’s 1.5 km beachfront is located along the gateway of the 7 km Laiya coast in San Juan, Batangas, which is considered one of the longest coastlines in Luzon. The Fourth in a series of LANDCO’s groundbreaking seaside communities, PLAYA LAIYA is designed to launch the next generation and sophisticated beach communities featuring world-class lifestyle and amenities which have made Peninsula de Punta Fuego, Terrazas de Punta Fuego, and Playa Calatagan addresses of choice – combined with new and improved features to address your ever-revolving lifestyle. We are pleased to offer you the opportunity to be among the very first to select your choice of properties at introductory prices. 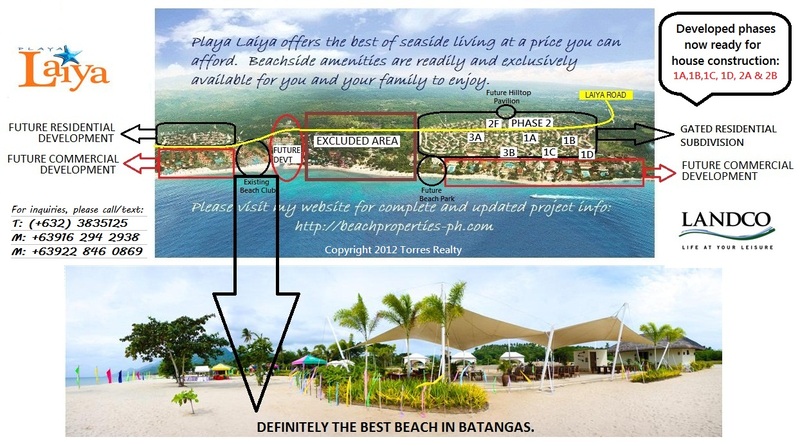 You can own a beach lot for as low as 23,000 Pesos a month! Live in your own specially rendered leisure escape where rusticity meets modernity, sophistication blends with simplicity, and serenity complements with energy. Design your own simple yet cozy beach house that’s just a stone’s throw away from the majestic Laiya beach and the 44-hectare commercial area. The Playa Laiya Community is uniquely Asian Tropical with a touch of contemporary perfectly exuding a sophisticated yet leisurely persona combining class with a “let your hair down” atmosphere. Beach Clubhouse. 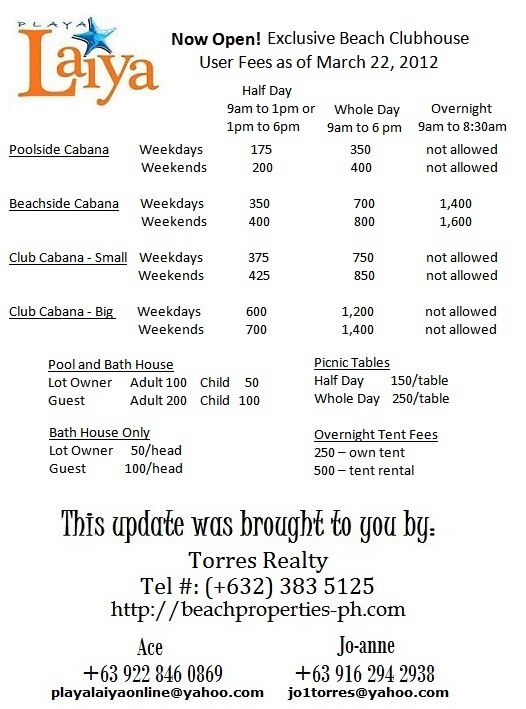 Lot owners are now enjoying an exclusive beach club facility right on the beach front of PLAYA LAIYA. The Beach Club features adult and kiddie pools, beachside cabanas, beachfront lounging area, bath house with shower and locker facilities, multi-purpose pavilion, picnic and grilling areas and water sports activities and facilities set on one of the most prime locations along the beachfront. Hilltop Pavilion. 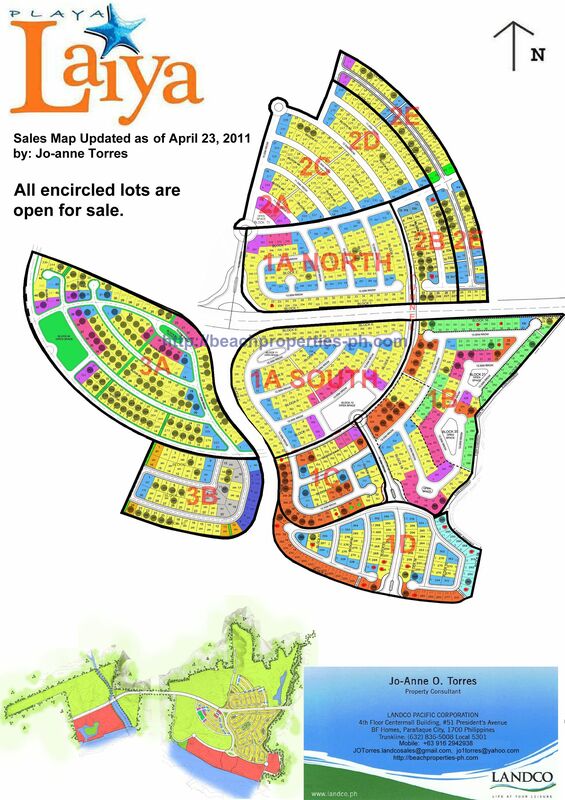 Designed as an exclusive function pavilion of the residential community, this facility is set atop a hill on the highest portion of the property offering commanding views of the Laiya coastline and the majestic Mt. Daguldol. Village Sports Center. Sports facilities for basketball and tennis shall be one of the features of the development. Parks and Playgrounds. Leisure pertains to fresh air and abundant trees and landscape. Playa Laiya shall then feature 5 parks each with its own theme and character suiting the needs of the members of the Playa Laiya Community. 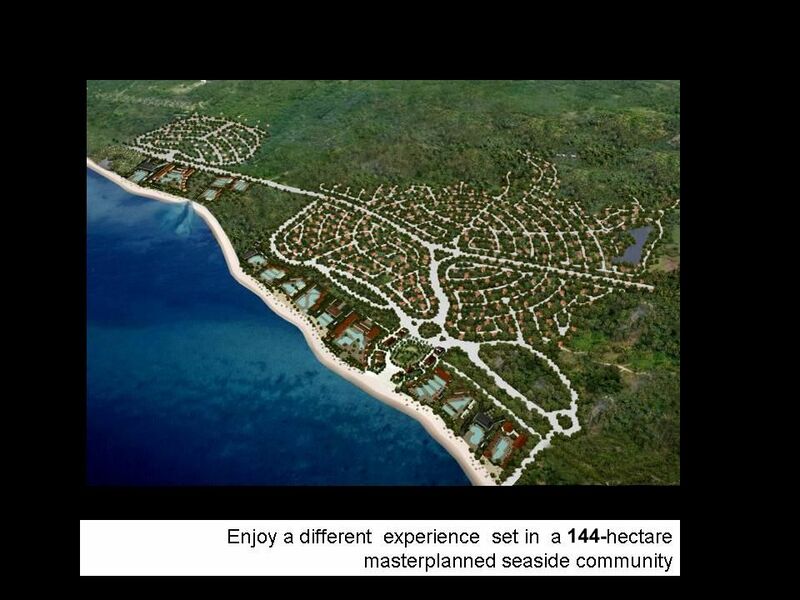 One of the parks shall be located at the beachfront within walking distance of the residents of Phase 3. It will feature bicycle paths, boardwalks, cabanas and a sports or events area. Envisioned to become one of the most coveted destinations in the Philippines, Playa Laiya shall become a hub for various tourism-oriented activities completing ones desired beach lifestyle. The park will feature a variety of hotels/ resorts/ condominiums, convention center, shops and dining areas, and a main plaza along a highly pedestrianized environment. At PLAYA LAIYA, everything comes together in harmony for a colorful and fulfilling leisure lifestyle. Indeed, the good life awaits you at PLAYA LAIYA.